It's a late Sunday afternoon at the start of spring break and I am thinking about time - how it's passing so quickly, how it drags between the hours of 4 PM and my kids' bedtimes, how I both savor and feel drained by this season of parenting small children. This year the Minnesota winter was mild and ended so gradually that I hardly noticed. These first warm days of April feel unearned - less like Resurrection and more like Grace. hurry, hurry, taking the house keys from my hands." I both love and hate this poem, seeing it's truth while pushing back and saying "how can I possibly not hurry when I have stuff to do? Where is this mythical perfect balance of unhurried living? Who can possibly be present all the time?" But I know its wisdom as I think about my harried impatience while dressing my kids, getting them into the car and out the door for preschool or for daycare, even while going for a walk to the library - I often hurry hurry hurry them and not always for good reason. 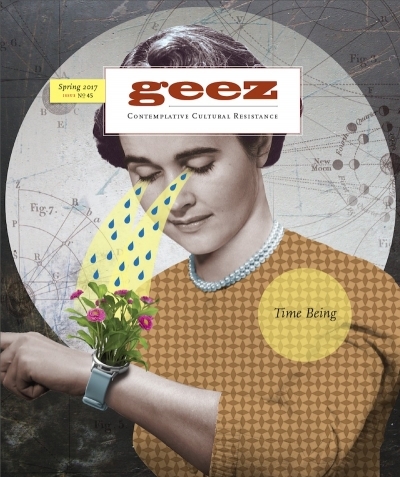 Yesterday I got the latest Geez Magazine in the mail (do you subscribe? you should) and lo and behold, the issue is all about time. The magazine bends toward to the slow movement - slow church, slow food, slow relationships - over the economized notion of time and instantaneous connection (and distraction) we encounter via technology and the internet. I am no Luddite; I have daily interactions with people via my smartphone that are as real and meaningful as those I have in my physical life. And yet, I know my relationship with the internet can easily slip into addiction as I seek out a quick escape from the monotony of the present. My perception of time is often one of scarcity -- there is never ever ever enough! --and yet I somehow manage to spend a good chunk of it scrolling my Twitter or Facebook feeds. As I wrestle with "hurry" and my relationship with time, I am looking into apps that limit my social media use to a certain amount of time each day and implementing rules for my smartphone use (like locking it in the office from 5-8 pm.) I am certain there is no fool-proof answer; that perfect balance is a myth that drives modern mothers into the mud of guilt. Still, I know it's a conundrum worth wrestling. I can't deny that my spiritual antennae are more attuned to the Holy Spirit when I have "moodling time" during my day -- when my mind is free to drift. When I can step back and wonder at my daughter's voice as she makes up a silly song, or my son who picks up every rock along the sidewalk.